1.Bd5 Kd2 2.e4 Ke3 3.e5 Kd4 4.e6 Kxd5 5.e7 h2 6.e8=Q h1=Q 7.Qa8+ looks as if it could be the main line. 1. Bd5 h2 2. 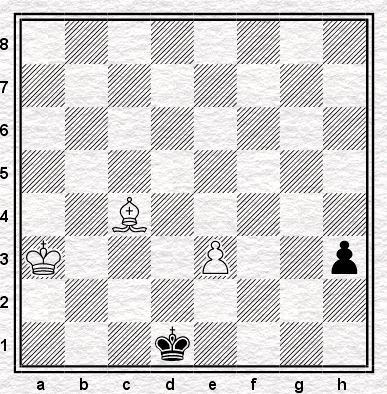 Bh1 Ke2 3. e4 Kf2 4. e5 disentangles bishop and pawn successfully. I'd better add the other variation now that it's just occurred to me: 1. Bd5 Ke2 2. e4 Ke3 3. e5 Kd4 4. e6 Kxd5 7. e7 h2 8. e8=Q h1=Q 9. Qa8+. Indeed. Sourced from the Chess Café, who have a splendid Archive.